It's been tough getting myself back into the swing of sewing, at least real sewing. There have been plenty of t-shirts to shorten and taper, buttons to replace and small tears to repair, but I sensed real trouble ahead when my husband asked "Can you remove the tags from all my t-shirts and sew up the sides again with that machine I bought you?" OH. MY. WHAT?! If I didn't find an in-depth project if I left myself open for the mind numbing work of unpicking the side seams of a dozen t-shirts and over-locking them back together again! To my rescue, the Pattern Review Sewing Bee. First challenge: a fitted, woven shirt. "That's no problem." I told myself. "I can whip up McCalls 6124 in a couple of days!" Of course it was Wednesday by the time I heard about it, but I easily convinced myself that I still had plenty of time to cut it out, sew it together and take pictures. After all, the fitting work was all behind me, and I had a long weekend ahead of me. McCall's 6124, roughly the view that I chose. Stephanie could use a classic white shirt to wear with her suit, after all. So, I found a white linen/rayon blend and started cutting it on Thursday. Then I got a phone call from a new client, with a "small project". That, along with sitting at the clinic with my son for three hours devoured my Friday (day and night). It still left me three days, though. How long can it take me to sew one shirt, with no pattern alterations required? I'm not a fast sewer. I should know myself better by now. I enjoy sewing slowly and thoughtfully. That doesn't change when I'm on a deadline. 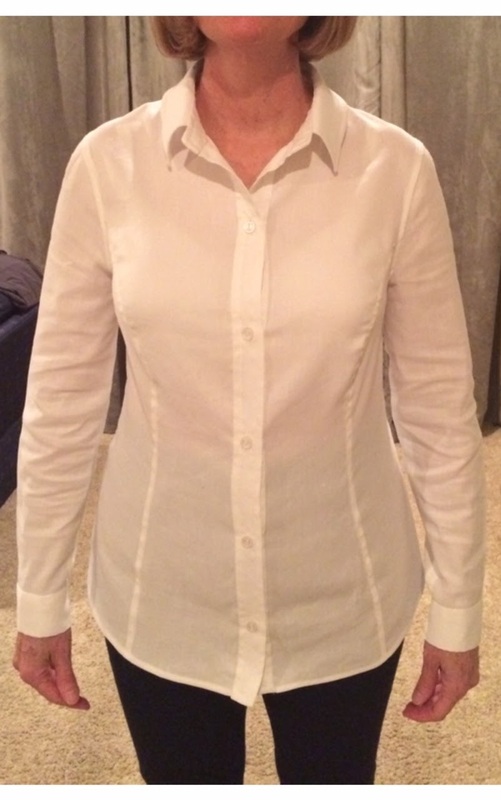 So I drove my family crazy in three days, adding opalescent top stitching to the front placket and collar stand, as well as a few other changes. I barely finished in time to submit the project after taking a few photos. M6124 with the opalescent top-stitching on all seams. I decided to take it off the placket & collar stand in the end. When my daughter came for dinner on Sunday it didn't occur to me to have her pose in the shirt (the side seams were still open, anyway). So I when I started filling out the contest form, I was dismayed to see that the front and back photos have to be taken on a human. Damn! One of the many off-center shots. So I wore it, while my husband took the photos. It actually fit me fairly well, even though Stephanie is three inches taller and nearly as many cup sizes bigger (I wore her bra). In the end, I changed into and out of the top for three rounds of photos. For some reason, Steve was unable to take a picture from the dead center, and they all had shadows and wrinkles that weren't really there. In one shot the left side of the collar turned up and the right side down. "Oh, I thought you did that on purpose." He replied. Really? Who wears a shirt collar like that? So I do not expect to make it beyond round one, given the photos I submitted. That's okay. I realized that tight sewing deadlines don't do me any favors. I am just happy to get back into the swing of things with a real sewing project, and am looking for other wardrobe builders for my daughter, who will need a business capsule for an upcoming trip. On to the review of McCall's 6124! I do like this pattern, with one exception. I'm not completely pleased that the front piece is slightly longer than the side front piece at the bust. I am accustomed to ease in the side front, instead, and it's just enough ease that it could appear that I cut it wrong or sewed it sloppily, instead of a nice shirred look. I managed to steam out most of the ease before sewing this time. If I make it again, I may add more length and shirr it. I know I said this last time, but I didn't want to mess with changing the pattern with a relatively short timeline. With the top-stitching unpicked in the front placket and collar stand. The reason I chose this pattern initially, was the fitting potential with the princess seams. I still like that, and think it's a flattering cut. The two-piece sleeve (in the full length) also makes fitting easy and hangs naturally, as well as giving an easy placket solution. The cuffs are simple to execute, as well. Sleeve seams are folded and top-stitched. I changed the shape of the hem from a straight hem, to a slightly rounded hem, by using the center front/back as the center point of the radius. Stephanie will most likely wear this tucked into a skirt, so that design detail may be irrelevant to her, but it pleased me. Split side seam. I may add a gusset here, as I'm worried about strength. Per the contest rules, I finished the interior seams nicely (which I would have done anyway). My plan was to use flat felled seams throughout, but I found that a simple turned-in seam with top-stitching looks so much neater, so I did that with the sleeve seams and the side seams. I shortened the hem from 5/8" to 1/2", because a narrower hem looked better. The fabric is a nice weight for a dress shirt, especially one that will be primarily worn under a jacket. 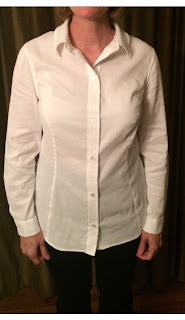 I was inspired to use white after reading about Sew-to-Fit's white shirt sew-along. It was difficult for me to sew with white, though. I can't recall a single item that I've ever sewn with plain white fabric. I wanted to paint it, or dye it or add some sort of embellishment. I considered slot seams or piping to jazz it up, and finally found a white solution for my need to bedazzle: opalescent top-stitching thread. It required a bit extra time to occasionally change the needle and thread, but it made me smile, and it adds some sparkle while remaining business-friendly. Although I came to appreciate the whiteness of the shirt in the end, I still worried about one thing: pit stains. Any white shirt I've owned has come to an early demise from sweat stains. So I drafted a pair of dress shields in muslin. Sure, you can buy them, but with the pattern still laying about, I drafted a pair to fit perfectly inside this shirt. The unbleached muslin is tan enough that it doesn't show under the slightly transparent white fabric. I may remove some length before serging the edges. Tally-ho! I am back in the swing of sewing real clothes and I'm on to more basics for Stephanie. She will need at least one more blouse and I've had a wrap dress pattern with her name on it for a year. If I look busy enough, maybe no one will ask about t-shirt alterations. "Oh, I thought you did that on purpose"
HAHAHAHAHA!!!!!!!!!!!!!!!!! That made me chuckle! Oh I think your shirt turned out really fantastic! And it's well sewn! I'm so glad someone else got a kick out of that! What a lovely shirt and opalescent thread. I've never heard of that! Thank you, Diana! The thread was with the Sulky embroidery thread, but indicated that a top-stitching needle should be used. It was fairly nice to work with, although it broke easily with the buttonholes, and I just used plain white thread for those.